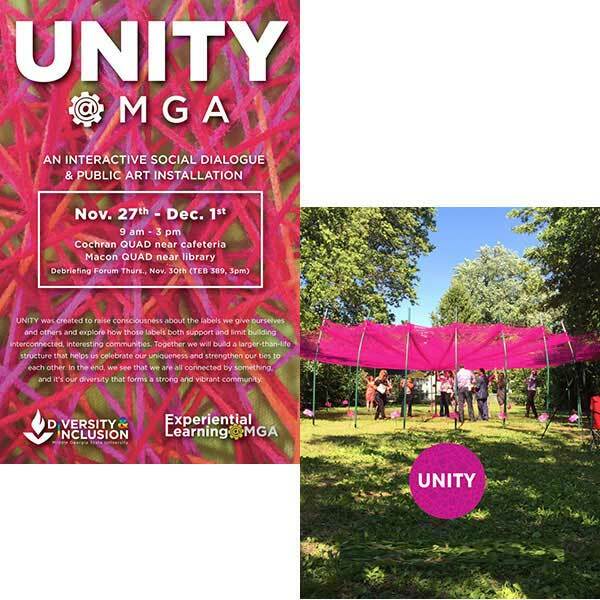 Middle Georgia State University (MGA) will host UNITY@MGA during the week of November 27- December 1, 2017, highlighting an interactive social dialogue through the creation of a public art installation on both the Macon and Cochran campuses. UNITY Week, celebrated by colleges and universities throughout the nation, is designed to create a dialogue on matters of diversity, inclusivity and solidarity. UNITY@MGA is being planned by the Office of Diversity, Inclusion, & Equity, the Office of Experiential Learning, and MGA students. From 9:00am to 3:00pm each day Monday, Nov. 27, through Friday, Dec. 1, students, faculty, staff, alumni and interested community members can participate at MGA's Cochran Quad near the cafeteria and the Macon Quad near the library to create a public art installation. Participants will tie colorful yarn to the posts that reflect their personal identifiers. The individual strands of yarn will intertwine with the yarn of others to create a web of connectedness. MGA’s faculty, staff, students, alumni, and the community will craft these larger-than-life structures to reflect our uniqueness and strengthen our ties to each other. Students who participate may also be eligible for Experiential Learning credit. The installations will remain in place through the current semester’s final exams and graduation. A debriefing forum and discussion will be held on Thursday, November 30th at 3:00-4:00pm in the Teacher Education Building, room 389 on the Macon Campus. For more information, contact Jenia Bacote, Director of Diversity, Inclusion, & Equity/Title IX Coordinator at 478.471.3627 or jenia.bacote@mga.edu, or Chris Tsavatewa, Director of Experiential Learning 478.471.2088 or chris.tsavatewa@mga.edu.